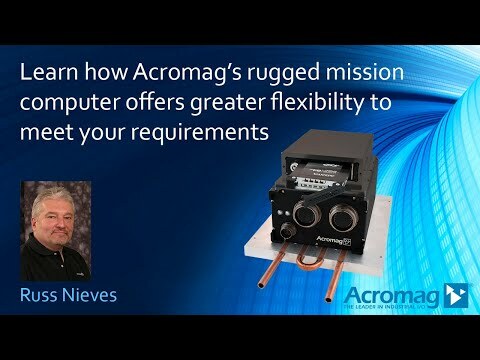 Acromag’s ARCX embedded computer is a customizable-off-the-shelf (COTS), SWaP-optimized deployable solution. This rugged, small form factor mission computer is designed for extreme rugged and MIL-AERO applications. This true COTS solution uses the Acromag COM Express Type 6 product platform. Typical applications include military/aerospace deployable systems such as: vetronics, C4ISR, payload management, as well as command and control for drones and robotics. More specifically the ARCX is perfect as a portable data acquisition system in an aircraft by adding a 1553 interface board to a dual unit. Add a FPGA and high-speed graphics card for high-speed video transfer. For multi-sensor monitoring on mobile applications simply add a CAN bus interface. Intel’s 4th generation of multi-core processors provides enhanced capabilities for floating-point-intensive computations, media, graphics, and security. Better power efficiency reduces heat and allows smaller, lighter designs with more portability. Cutting-edge technology features programmable power limits, allowing the user to "dial-down" the maximum power consumption of the CPU in systems where heat and/or power is a concern. The ARCX is designed and tested to meet IP67 ratings for reliably sealed protection from dust and limited immersion. Thick circuit boards and advanced thermal management allow the computer to operate reliably under hostile conditions. This rugged computer can withstand extended temperatures. Shock and vibration has been tested to MIL-STD-810 specifications. The front panel features 38999 type high-speed cylindrical connectors for extended I/O interfacing. Optional power filter is designed to meet the requirements of MIL-STD-704 and MIL-STD-1275. Optional power filter is designed to meet the requirements of MIL-STD-704 and MIL-STD-1275. Optional removable solid state drives allows for a variety of configurations including quick security access. Load the operating system on one drive and then collect data on the other drive. The ARCX offers great flexibility to meet ever-changing requirements for long-term applications with its customizable-off-the-shelf (COTS) design. PMC, XMC, Mini PCIe and mSATA slots allow the addition of specialized I/O, storage, and FPGA modules. Optional removable solid state drives allow large amounts of data storage plus quick security access.